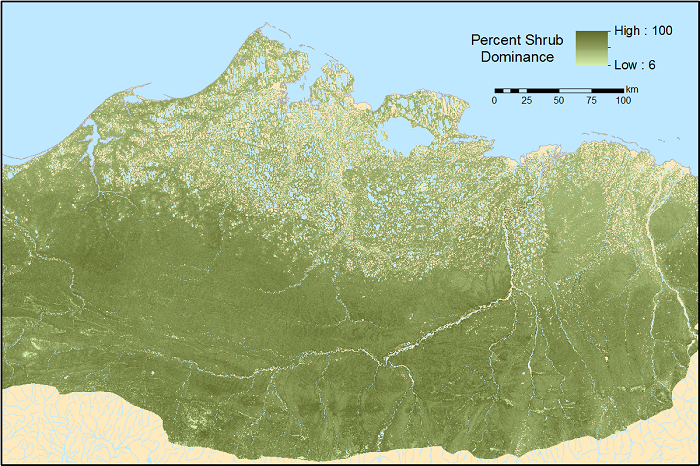 This dataset includes 30-m gridded estimates of total plant aboveground biomass (AGB), the shrub AGB, and the shrub dominance (shrub/plant AGB) for non-water portions of the Beaufort Coastal Plain and Brooks Foothills ecoregions of the North Slope of Alaska. The estimates were derived by linking biomass harvests from 28 published field site datasets with NDVI from a regional Landsat mosaic derived from Landsat 5 and 7 satellite imagery. The data cover the period 2007-06-01 to 2016-08-31. The data provided are the best estimates from the described modeling and Monte Carlo approach for each 30-m pixel in the Landsat mosaic at the 50th percentile, and also at the 2.5 and 97.5 percentiles for each data type (plant AGB, shrub AGB, and shrub dominance) which together encompass 95% of predictions. The published field measurements of total plant and shrub AGB used in the modeling were collected between July 1998 and August 2008. The mean and standard error (SE) of plant and shrub AGB were also acquired or computed for the data at each site. The regional Landsat NDVI mosaic was derived from 1,721 summer scenes acquired between 2007 and 2016. Spectral reflectance information was extracted from these 'peak greenness' scenes on a per pixel basis. Empirical AGB-NDVI relationships were developed for the field sites and the relationships were applied to the mosaic. The Monte Carlo uncertainty analysis involved generating 1,000 regional maps of each ecosystem data type, where each map was produced by randomly permuting the underlying field and remote sensing datasets by their uncertainty due to sampling and sensor calibration errors. The data with this dataset are the 50th percentile (best estimates), the 2.5, and 97.5 percentiles of the 1,000 permutations. There are nine data files of mapped AGB and shrub dominance with this dataset in GeoTIFF (.tif) format and one shapefile (.shp) provided in compressed (.zip) format which provides the study locations. The study locations are also provided as a companion file in .kmz format for viewing in Google Earth. A companion file of the published field measurements of total plant and shrub AGB used in the modeling is also available as a .csv file. Figure 1. The best estimate (50th percentile) of 30-m shrub dominance (shrub/plant AGB) for non-water portions of the Beaufort Coastal Plain and Brooks Foothills ecoregions of the North Slope of Alaska. The published field measurements of total plant and shrub AGB used in the modeling were collected between July1998 and August 2008. The mean and standard error (SE) of plant and shrub AGB were also acquired or computed for the data at each site. The regional Landsat NDVI mosaic was derived from 1,721 summer scenes acquired between 2007 and 2016. Spectral reflectance information was extracted from these 'peak greenness' scenes on a per pixel basis. Empirical AGB-NDVI relationships were developed for the field sites and the relationships were applied to the mosaic. The Monte Carlo uncertainty analysis involved generating 1,000 regional maps of each ecosystem data type, where each map was produced by randomly permuting the underlying field and remote sensing datasets by their uncertainty due to sampling and sensor calibration errors. The data with this dataset are the 50th percentile (best estimates), the 2.5, and 97.5 percentiles of the 1,000 permutations. The Arctic-Boreal Vulnerability Experiment (ABoVE) is a NASA Terrestrial Ecology Program field campaign based in Alaska and western Canada between 2016 and 2021. Research for ABoVE links field-based, process-level studies with geospatial data products derived from airborne and satellite sensors, providing a foundation for improving the analysis and modeling capabilities needed to understand and predict ecosystem responses and societal implications. This study was funded by NASA's Arctic-Boreal Vulnerability Experiment (Grant number: NNX17AE44G). Spatial Coverage: The study area encompassed the Beafort Coastal Plain and Brooks Foothills ecoregions of the North Slope, though published field data from the Seward Peninsula and the North West Territories were also used in the analysis. The data are best-estimates of plant AGB, shrub AGB, and shrub dominance for each pixel in the regional Landsat mosaic, for the North Slope study areas. The best-estimates were the 50th percentile of the 1,000 permutations for each pixel. Data are also included for the 2.5 and 97.5 percentiles of the 1,000 permutations. These data could be useful to climate change and vegetation studies in the Alaskan Arctic. The dataset includes uncertainty estimates derived from a Monte Carlo analysis and was also evaluated through comparisons with (1) field measurements of shrub canopy height, (2) independent remote sensing estimates of shrub canopy cover, and (3) high-resolution satellite and aerial imagery. The Monte Carlo analysis involved developing 1,000 estimates of plant and shrub AGB for each 30-m resolution pixel in the study area. This analysis accounted for spatial variation in biomass harvest and Landsat NDVI measurements at each field site, as well as uncertainty in Landsat sensor calibration. The dataset includes our best estimate of each plant attribute (i.e., pixel-wise median of the 1,000 realizations). The dataset also includes 2.5 and 97.5 percentiles of each attribute from the 1,000 realizations, which facilitates creation of 95% confidence intervals for each pixel. The study area encompassed the Beafort Coastal Plain and Brooks Foothills ecoregions of the North Slope, though published field data from the Seward Peninsula and the North West Territories were also used in the analysis. The Beaufort Coastal Plain supports extensive lowland tundra plant communities often dominated by sedges and small shrubs. The warmer Brooks Foothills supports tussock tundra, shrub tundra, and mixed tundra communities. Field measurements were derived from clip harvests at tundra sites on the North Slope (n=14), the Seward Peninsula (n=7), and in northern Canada (n=3). The uncertainty estimates provided in this dataset were derived from a Monte Carlo analysis and were evaluated through comparisons with (1) field measurements of shrub canopy height, (2) independent remote sensing estimates of shrub canopy cover, and (3) high-resolution satellite and aerial imagery.